Guest post by Annelise Dowd. Annelise is a recent graduate of the McGill University Master of Information Studies program who worked on a practicum project working with the Student Publication Collection. With 140 years of student produced content, covered in 9,868 issues in eighteen unique papers, the student publications at McGill has a rich history. Student publications include widely disseminated student newspapers written and published by students on both the downtown and Macdonald campuses, covering the events, daily life, and opinions of students. From lofty intellectualism of nineteenth century McGill publications, to the anti-war resistance of 1960s The McGill Daily issues, the student papers at McGill shifted greatly in content and scope. However, what these publications do share is the virtue of revealing not only the lives of McGill students, but also that of a young residents of Montreal, Canada, and the larger world. The first student newspaper, the McGill University Gazette, was published by McGill undergraduates in 1874. Indicative of its time, this monthly published nineteenth century paper focused on literary merit and only published controversial material if it was written in a “gentlemanly manner.” Due to a lack of enthusiasm from students and lack of financial organization from publication staff, the newspaper ceased publication in 1890, not to be replaced by the McGill Fortnightly until 1892. The McGill Fortnightly, aptly published bi-weekly, aimed to not repeat the oversight of the Gazette through the creation of a business board and a focus on student activities. However, the Fortnightly ran for only four years, as students demanded a weekly newspaper. In the words of the editor-in-chief Lucy E. Potter in the weekly published 1898 first issue of the McGill Outlook, “no one cared to read news a fortnight old.” The McGill Outlook was a departure from the papers that preceded it, in both it’s new creative format, as well as the inclusion of the first woman editor-in-chief, the aforementioned Lucy E. Potter. The last of the pre-Daily publications was the The McGill Martlet, founded after the Outlook ceased publication due to a lack of financial support. First published in 1908 as a “modernized” weekly, the Martlet was hugely popular. In fact, the demand for more frequent issues of the paper was so great, after only three years of publication the Martlet was transformed into what became the longest running newspaper at McGill. By 1910, student publishing was already an institution on the McGill campus. students at the recently opened Macdonald campus felt they needed a student paper that reflected their distinct viewpoint. The Macdonald College Magazine, first published in 1910, aimed to fill this demand for a Macdonald campus student publication. Featuring not only student activities, but also agricultural trends, rural life, and scientific articles, the College Magazine and sought to acknowledge the unique experiences of “rural” McGillians. The magazine ran for over twenty years, until in 1932 the administration chose to produce a weekly newspaper and the Macdonald College Annual to give more space for news of student activities. The Failt-Ye Times introduced in 1932 was the first true student newspaper, focusing on current events and student activities at the Macdonald campus. The paper continued its run successfully into the late 1960’s, and during this period successors of The Macdonald College Magazine, The Macdonald College Journal (1940) and the Macdonald Farm Journal (1952) were published to fulfill the need for specific agricultural-related information. In 1968, during a particularly politically turbulent period, the Failt-Ye Times changed both its format and philosophy, resulted in its new incarnation, the activist-leaning The Dram. The Dram was published weekly, and was much more radical than its predecessor. The paper ran for four years, until threats of financial austerity from the Student Council and inexperienced executives, lead to the demise of the paper in 1972. The Harvest replaced The Dram in 1973, published bi-monthly or less frequently, due to reduced funding and support. The Harvest continued sporadically until 1990, when resources were decreased to the extent that the paper could no longer be produced. 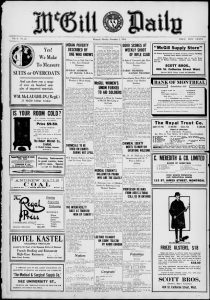 While other publications were short-lived, the introduction of The McGill Daily in 1911 marked the format that would remain a fixture at McGill for over a century. The McGill Daily began, like other student papers, as a report of student activities and sports events. Published “daily” – usually four times a week, The Daily aimed to mirror The Montreal Gazette and other major newspapers of the time. 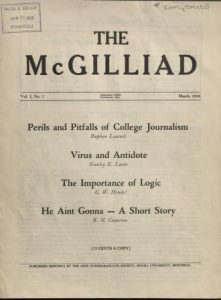 By the late 1960s, The McGill Daily had become a vehicle for outspoken students, facing opposition from student government and the administration. This initial coverage of hard hitting issues like reproductive rights, the Vietnam War, and racism broke ground for the brave work continued by McGill student journalists through the 1970s until the present. Multiple other McGill student publications were also published during the The Daily’s run. 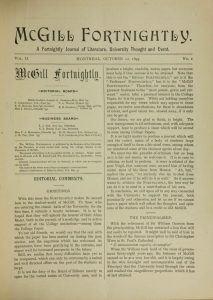 The McGill Fortnightly Review was introduced as a literary newspaper in 1925 due to the success of The Daily’s literary supplement. The paper was short-lived, only lasting for two years, but it’s brief publication was memorable due to outspoken and subversive writers on staff. The Fortnightly Review was succeeded by The McGilliad, a paper published monthly by the Arts Undergraduate Society from 1930-31. Like the Fortnightly Review, The McGilliad focused on “uncensored” literary works, permitting student journalists freer expression than what was traditionally afforded. Despite high-profile contributors such as Stephen Leacock, The McGilliad ceased publication due to a lack of planning and coordination. 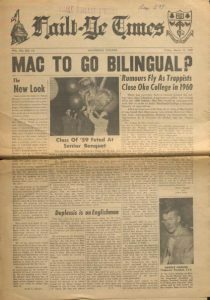 Although there is no question that other alternative small-press student publications have circulated within the twentieth century at McGill, the major alternatives to The Daily did not emerge again until the late 1960’s. During this time there was high contention between student government, the university administration, and The McGill Daily. In 1968 the editor-in-chief of The Daily was forcibly removed by the McGill Student’s Society due to strong political statements regarding the Vietnam War. The year of 1968 included a flurry of new publications, including The McGill Free Press introduced initially as a placeholder paper for The Daily while it was on hiatus. To oppose the viewpoints of The Daily and The Free Press, the McGill Students Society published a short run of it’s own paper from 1966-68, Public Address. The paper functioned to clarify misconceptions about the views of student government and contributed to the fiery banter between the multiple publications in print at McGill during this period. The collection of student publications also hold more current papers in addition to the historical publications. 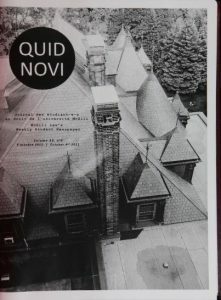 Quid Novi, is the weekly published law students paper was first published in 1981 and still continues to be published today. The paper focuses on both the activities of the student law society and provides space for “investigative journalism” into the problems within the law faculty and administration. The McGill Daily produced a weekly french edition of the paper, but in 1998 is was renamed Le Délit Français, giving a distinct identity to the francophone student publication. Le Délit aimed to not merely be a french translation of The Daily, but instead to give voice to the distinct perspective of McGill francophone students. Student media continues to thrive at McGill, with great debt to its past. The collection of McGill student publications serves not only as a testament to the history of McGill, but also as a fascinating look at the origins of now prominent alumni. In the pages of these student newspapers, the likes of Leonard Cohen, Stephen Leacock, Otto Klineberg, Eugene Forsey, F.R. Scott, Daryl Hine, Suroosh Alvi, Adam Gopnik, and Suniti Namjoshi can be found. Guest post by Annelise Dowd. Annelise is a McGill University Master of Information Studies student who has been doing a practicum project working with the Student Publication Collection. Public Address was a weekly student paper first published in 1966. The paper was intended to be the vocal arm of the McGill Students Society, aiming to clarify “misconceptions” about student government. These supposed misunderstandings were largely due to the criticism the student society faced in the late sixties from The McGill Daily. 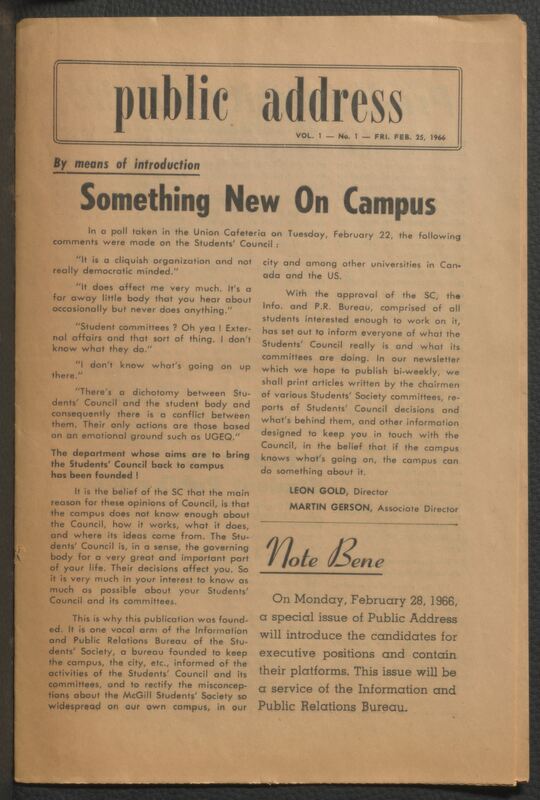 In 1968 the paper changed format, and focused less on the contention between student government and the student body. This revised format of the paper soon ceased publication however, with only six issues produced. Cover page. Public address Vol. 01 No.001: February 25, 1966. McGill University. From Rare Books & Special Collections – Colgate Collection. Colgate Dwiggins Coll. I. 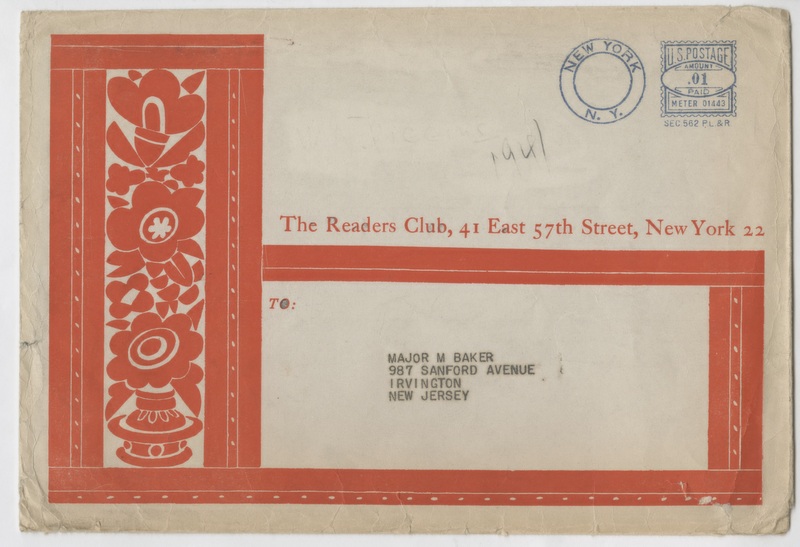 Addressed to Major M. Baker, New Jersey. 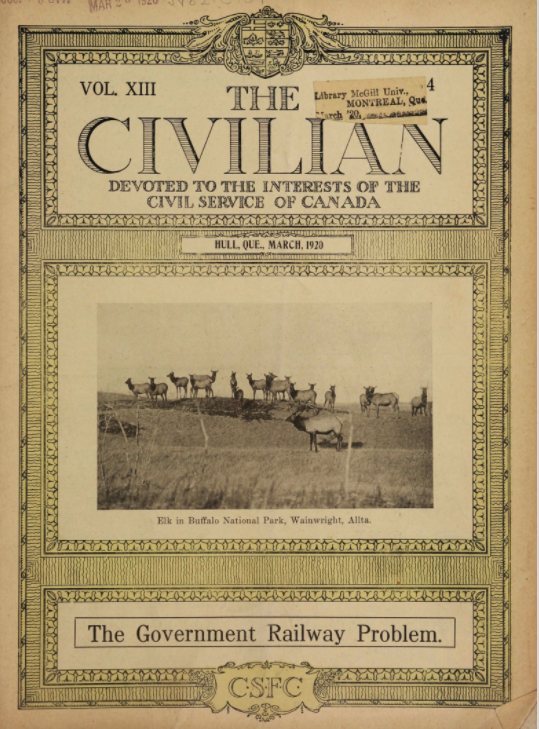 New online: The Civilian : a fortnightly journal devoted to the interests of the Civil Service of Canada. 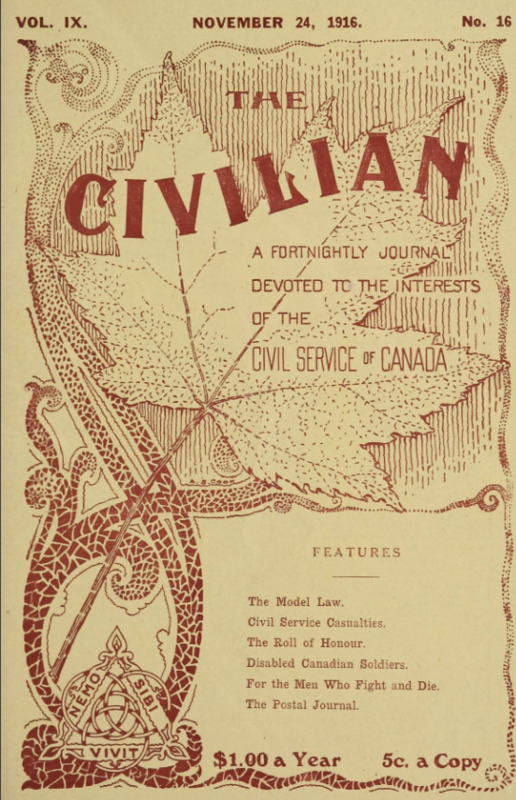 141 issues of the The Civilian : a fortnightly journal devoted to the interests of the Civil Service of Canada from March 1913 to November 1920 are now available through our library catalogue and the internet archive. From the cataloguing notes: The postal journal, for a time numbered separately, appeared as part of the Civilian. It was “edited under the auspices of the Postal Clerks’ Association of the Dominion of Canada”. 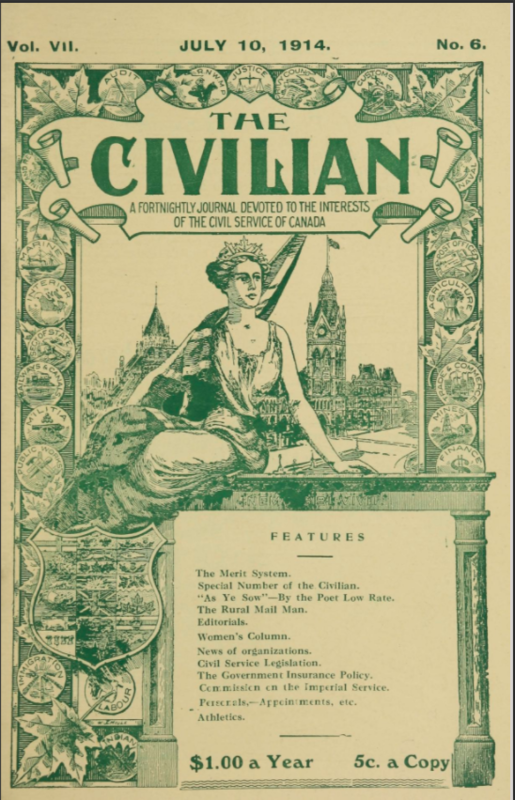 Latterly it was superseded by a column entitled “Postal notes.” Official publication of the Civil Service Federation of Canada, 1917-July 1920; of the Associated Federal Employees of Ottawa, Aug. 1920-1921. Established and edited by Frank Grierson, May 1908-Mar. 1920. 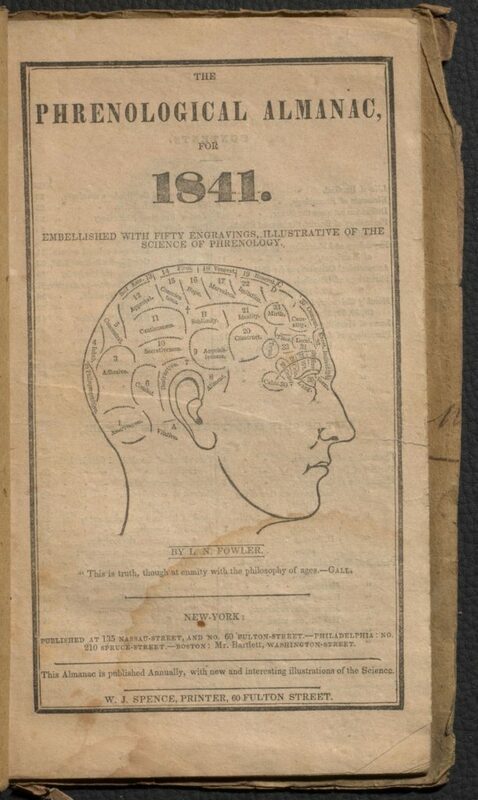 We are please to announced we’ve partnered with Medical Heritage Library and joined some of the world’s leading medical libraries in making our digitized content available in their collaborative digital library. One of the biggest advantages of these aggregate digital libraries is not only being able to do a full text search across multiple collections at a time but you can also download the records in JSON, XML and CSV format. We’ve submitted our first batch of material from our Osler Library of the History of Medicine collection which includes 37 handwritten notebooks from Sir William Olser, Clare Gass’s diary from 1915-1916 and various Arabic and Persian medicinal texts such as this 11th century ophthalmology text. #ColorOurCollections / #ColourOurCollections week is back from February 6 to 10, 2017! We had so much fun with this campaign last year we couldn’t wait to put out some new pages. This year we’ve created three pages for you to download and colour. 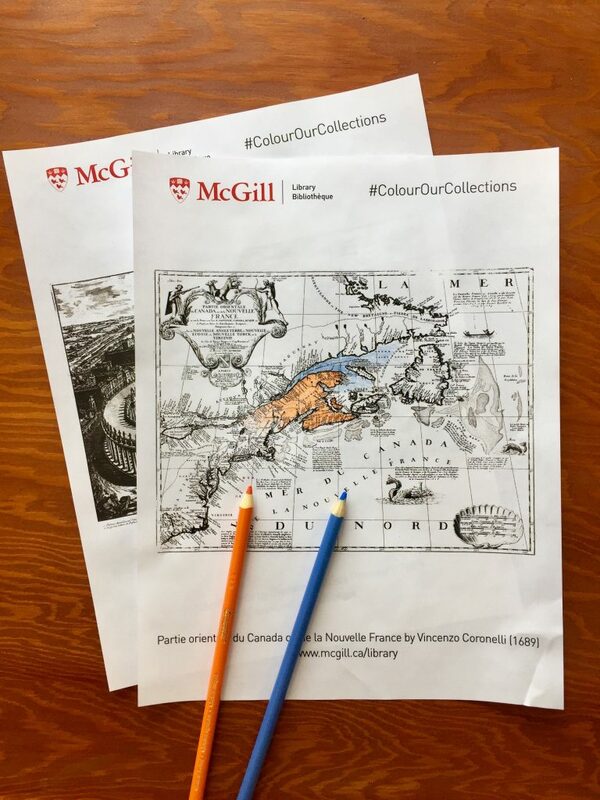 When you’ve finished your masterpiece we encourage you to share them on social media using the event hashtag #ColorOurCollections or tag us on twitter @McGillLib. It’s been fun seeing what everyone comes up with! #ColorOurCollections was a campaign spearheaded last year by by the New York Academy of Medicine (NYAM), the New York Public Library (NYPL), the Smithsonian Libraries and the Biodiversity Heritage Library. From the cataloguing notes: Marie-Angélique Birranger was the wife of Henri Desrivières (1804-1865), the son of François Amable Desrivières (1764-1830), principal heir of James McGill. Henri Desrivières was a seigneur of Montarville and a political figure in Canada Est who represented Verchères in the Legislative Assembly of the Province of Canada in 1841. 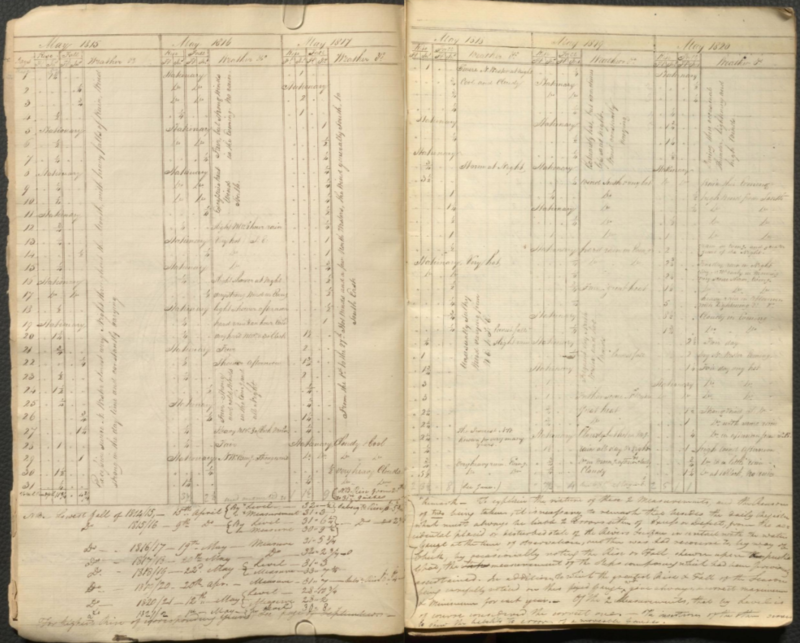 The diary describes social, family and economic life in Montreal and Stanbridge, Québec from 1843 to 1872. There are also many comments about the weather and the author’s health. Written in a legible but rather careless hand in black ink on ruled pages; unused pages at back of notebook have been torn out. 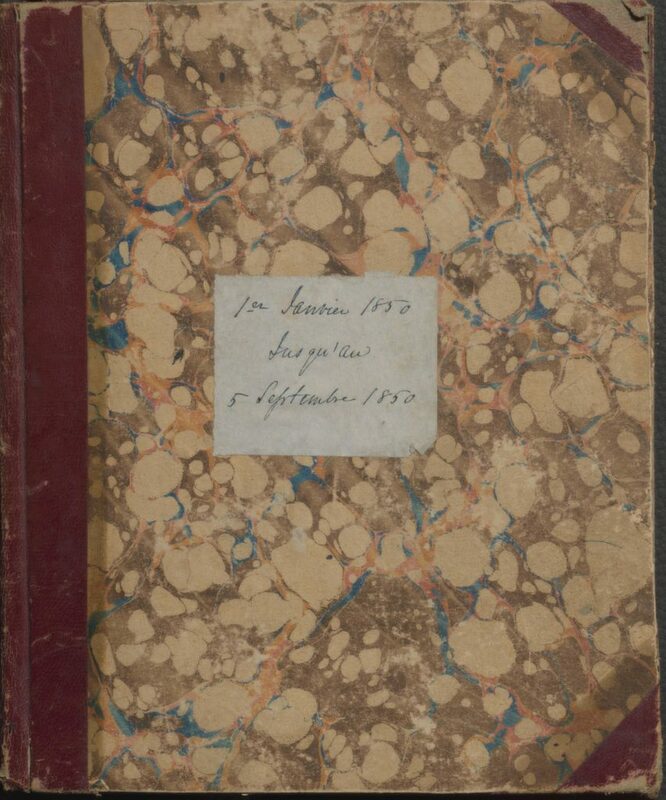 My journal, 1855 : 12th November/55. 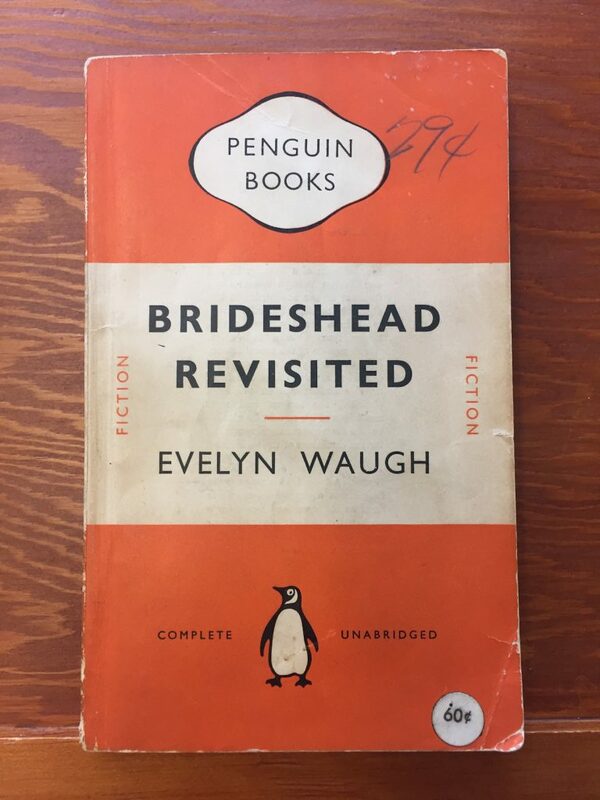 This week we are pleased to bring you this fully digitized copy of Evelyn Waugh’s famed 1945 novel Brideshead revisited. We selected this volume for digitization in honour of Public Domain Day, which took place on the first day of this month. In Canada (and a host of other countries) copyright in a published work expires 50 years from the end of the calendar year in which its creator died. As such, on January 1st, 2017, published works by artists, writers and other creators who died in 1966, like Evelyn Waugh, legally entered the public domain. In countries with a “life +70 years” term of copyright, including Australia, Russian and much of the Europe Union, the works of authors who died in 1946 are now in the public domain. The U.S. too, has a “life + 70 years” copyright term, but due to copyright extension legislation, no published works will be entering the public domain on January 1st until at least 2019. Once copyright has expired, neither permission nor payment are required to copy, distribute, modify or incorporate these works into new creative or intellectual works or make them available to the public in Canada. 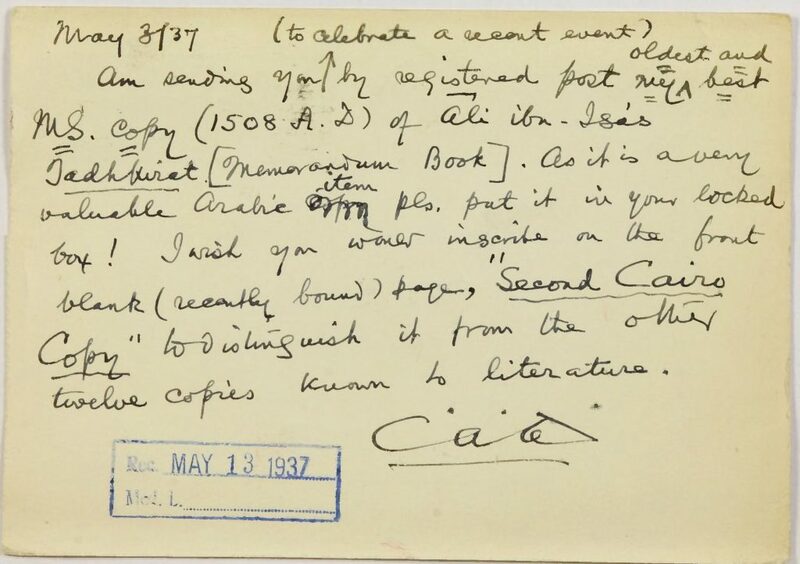 The print copy of the novel is held in McGill Library’s Rare Books and Special Collections, a gift of the estate of Louis Dudek, poet, essayist, critic, and editor. Dudek (1918 – 2001) completed his studies at McGill and Columbia before joining the McGill Faculty of English in the 1950s as professor of modern poetry. The Louis Dudek Collection includes more than 6,000 titles, available for consultation in our reading room during opening hours. 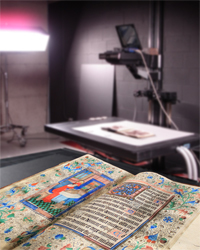 McGill Library has an active digitization program and makes every effort to open up our rare and unique collections to the world by putting them online for everyone. A warm thank you to Jennifer Garland, Rare Books and Special Collections librarian and Greg Houston, Digitization and New Media Administrator for helping with this small project. 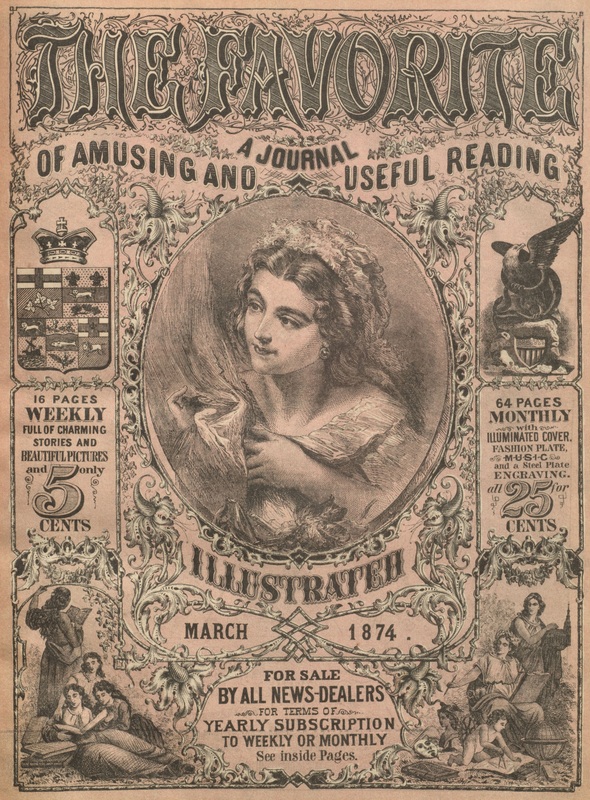 83 issues of the The Favorite: A journal of amusing and useful reading published by George Edouard Desbarats (Montreal) from 1873-1874 are now available for reading and download on the Internet Archive.